Among the most prominent galaxies in the autumn skies is NGC 7331, a magnificent spiral galaxy at a distance of about 50 million lightyears. Easily visible through mid-sized telescopes is only the bright core while the spiral arms require long-exposed photographs. 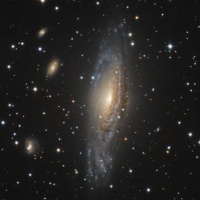 The arms extend to about 100,000 lightyears hence this galaxy being about the size of our Milkyway. UGC galaxies are often tiny and not exactly spectacular. This one is different: The pair of UGC 1810/13, also known as Arp 273, is a masterpiece of art: Prominent spiral arms reveal plenty of detail which can also be distinguished by its colour. Make sure to view the highest resolution. 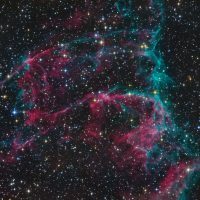 IC 1340 is the southern end of the eastern part of the Cirrus Nebula NGC 6992/6995. Actually, IC 1340 refers to the small condensation on the top left reminding of waves in the interstellar medium. In this picture, south is up, east to the right. 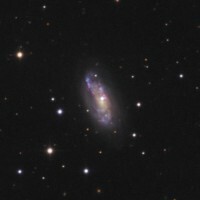 NGC 5371 is situated in the constellation of Canes Venatici half way towards Bootes. 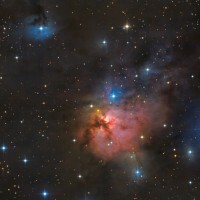 It is about 110 million lightyears in distance from Earth and its diameter is said to be about 130,000 lightyears. Hence, this face-on barred spiral galaxy is about 1/3 larger in diameter than our Milkyway. 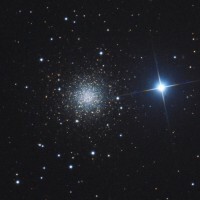 NGC 6207 is a tiny galaxy next to the famous cluster M13 in the constellation of Hercules. It can be observed in the evening skies during May and June. It is about 46 million lightyears in distance from Earth. 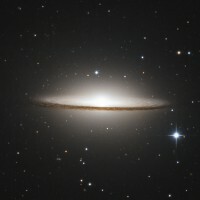 For its famous shape, this almost edge-on galaxy is well known under the name „Sombrero Galaxy“. The shape is formed by dust lanes projected against the galaxy’s core. 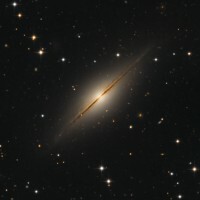 This Sa or Sb-type spiral galaxy is located appr. 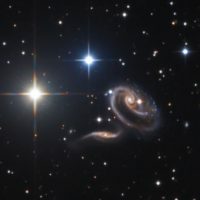 30 million lightyears from Earth and has a diameter of appr. 50,000 lightyears. 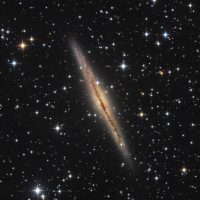 NGC 7814 is an almost perfect sample of an edge-on spiral galaxy. Watching the galaxy nearly from its equator plane the dust lanes prominently project against the galactic core. 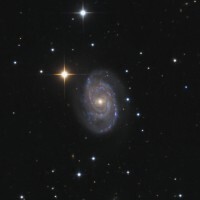 This spiral galaxy is situated about 50 million lightyears from Earth and expands about 80,000 lightyears in diameter. 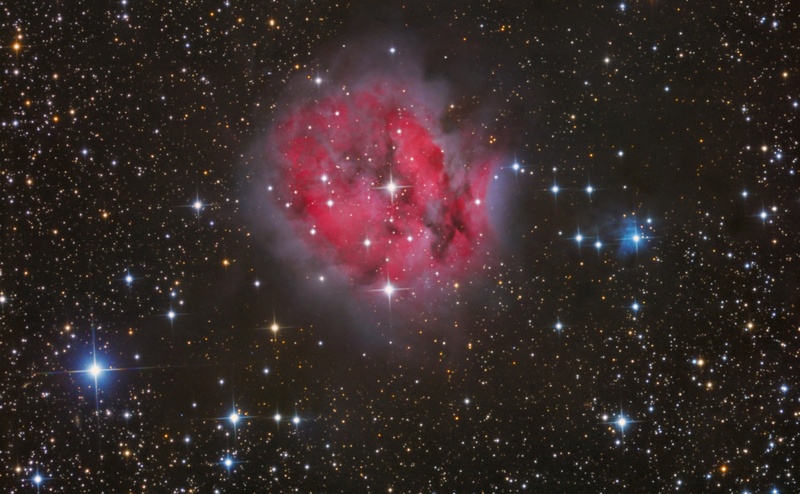 NGC 1579 became famous as the „northern trifid nebula“ for its eye-catching dust lanes apparently dividing the nebula into several parts. A combination of luminescent gas (red) and illuminated interstellar material (blue) add up to the colorful arrangement thrilling the observer to dunk deeply into the scenery. NGC 2419 is often called the „Intergalactic Wanderer“, an appropriate title considering its distance of some 300,000 lightyears from Earth. Compare this to the appr. 160,000 lightyears to the Magellanic Clouds, the Milkyway’s closest satellite galaxies. The Cluster might well be the remains of an ancient galaxy cought by our Milkyway’s force of gravity.